I had heard a lot about this beach and was curious to see it for myself. Friends had come down one weekend, so we set out to Morjim, eager to catch the beautiful sunset. Having frequented the more touristy beaches earlier, this one seemed quieter with fewer shacks and we could hardly see any Indian tourists. All along the beach, I could spot foreigners, mostly Russians, relaxing on beach beds with books for company as kids played around building sand castles. Being lean season, the shacks were fewer and I could see quite an isolated stretch towards the other side. 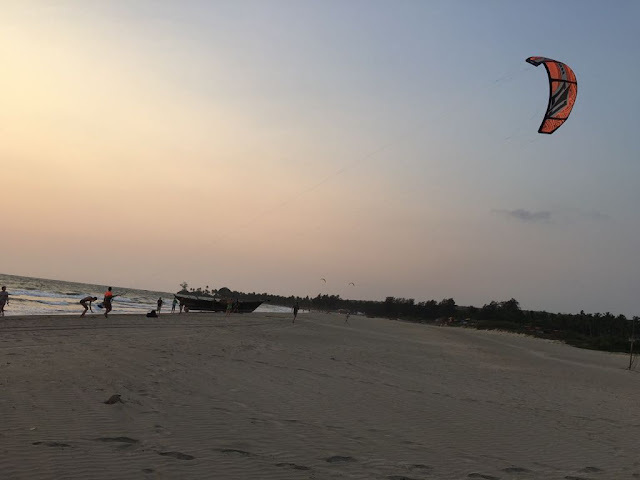 Later, we were told that Morjim, being the nesting place for the endangered Olive Ridley Turtles, the government had limited the shacks and other tourist activities to just one part of the beach. Also, loud music and partying is not allowed late into the night here, so the beach gets isolated as night approaches. 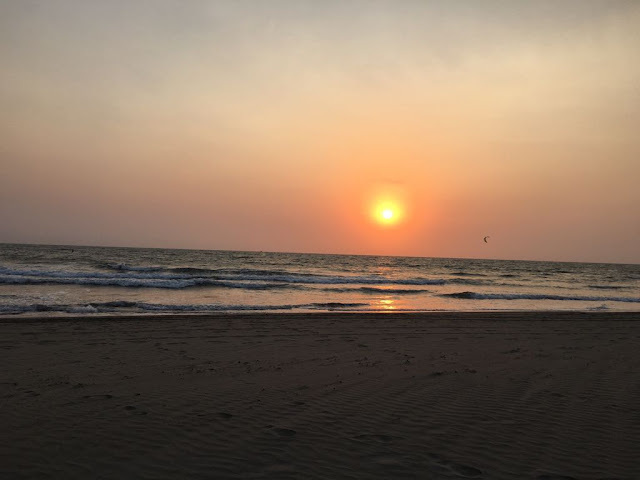 While some of our friends waded into the sea for a swim, the rest of us settled down on the soft sandy beach as the sun started making its descent. It was a beautiful sight to watch, with the orange light spread all over the sky, and the sea glistening with the last of the rays. 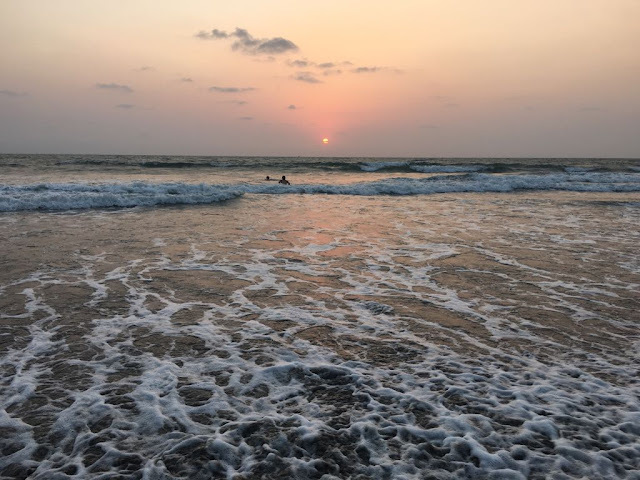 Morjim is a good choice if you want to take a quiet walk along the beach or wish to take a dip in the cool waters since it is not over crowded and clean. You will be saved from (often) overbearing loud music and hence its a great spot if you are looking to unwind and relax on a quiet beach. We sat there on the beach , as the sun made its final dip, leaving us in a twilight. We were brought back from this trance by the shrill whistles from life-guards, reminding the tourists that it was getting dark and hence refrain from swimming or any other water related activity. Morjim beach is around 28km from Panjim. From the airport, it is 44kms. Cabs are easily available from the airport or Panjim. If you are staying at panjim, you can rent a two-wheeler too. 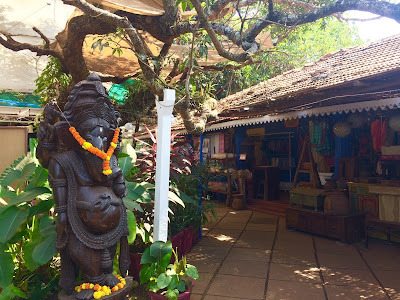 There are quite a few cozy, colorful shacks on the beach serving the traditional Goan cuisine as well as the north indian and indo-chinese staples and even Russian! ( Yeah you heard it right!). So if you are open to experimentation you will enjoy it here. Personally I would suggest a visit to 'Bora Bora' a popular shack- restaurant on the beach owned by a russian. Its been there for a long time now so it is thronged by tourists and locals alike. You can also check out the restaurant at Montego Bay resort. The food is good and the place opens out into the beach. Like I said, it's a peaceful spot and is away from the regular hustle bustle of tourits. Relax on a beach bed with a book or your favorite music. Enjoy delicious food right on the beach and go back to a little siesta on your beach bed. Enjoy the lovely sunset over some drinks and if you are in a mood to party, head to The Marbela beach resort or Club Fresh nearby. Also,take a stroll through the Morjim village - a quaint little village dotted by lots of guest houses and eateries and shops selling clothes with signboards in Russian; you will know that this place is called Little Russia for a reason!